Breitovo pigs are a general purpose swine from Russia. They were bred in the Yaroslavl region as a result of crossing local pigs with Danish landrace, large white and medium white breeds of pigs. They became widespread in the north-west of Russia, in the Volga region, and in the Urals. They were taken out against a background of voluminous feeding with a large quantity of potatoes. They are predominantly white, but some have darker skins. They have great fertility strong constitution, and are large. Adult boars average 310-330 kg, sows 220-240 kg. Their head is of medium length with a noticeable curve of the profile, but not pug-shaped. Their ears are long and drooping. Their neck is of medium length, broad, and muscular. Their chest is wide and deep. Their back and waist are muscular. Their legs are well developed and their sides rounded. Their legs are strong and straight. 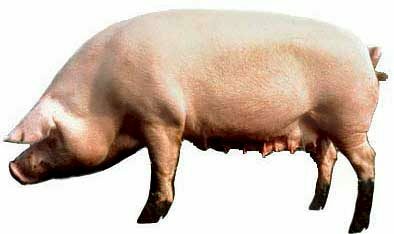 Sows have liters 11-12 pigs twice a year. Their high multiplicity persists until five to six years of age. On sow named Rosa gave birth to 206 pigs from 16 birthings. Breitovo are calm, they have an increased resilience, adapt well to local conditions, and have endurance to low temperatures. Their meat has marbling, good color intensity, and high protein-quality index.